This is a gold cable wire stainless steel magnetic bracelet. Under the gold, it is completely made of stainless steel. The 2 - 3000 gauss neodymium rare earth bio north facing magnets are in the 18k gold plated solid stainless steel M&M shaped ends. 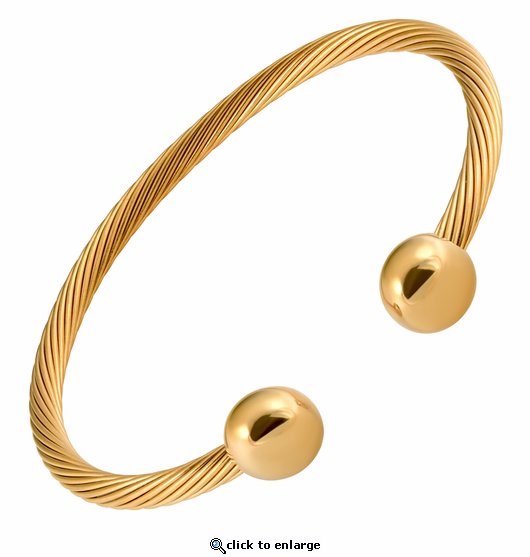 This fine quality nickel free magnetic bracelet is made with 18k gold plated stainless steel twisted wire.